In an EMERGENCY please Dial 911 or proceed immediately to the emergency department. Call your primary care physician first, before proceeding to the hospital. Many insurance companies and HMO’s require prior authorization for emergency treatment. However, only a health care professional can properly evaluate the situation. Emergency Departments all over the United States are seeing increasing numbers of patients coming to the ED for treatment. The Emergency Department of Southern Ohio Medical Center is committed to customer satisfaction as reported by Professional Research Consultants (PRC). The ED sees 46,000 patient visits annually. The entire Emergency Department staff – physicians and nurses – is committed to continuing improvement and providing excellent care to the patients of the Emergency Department. 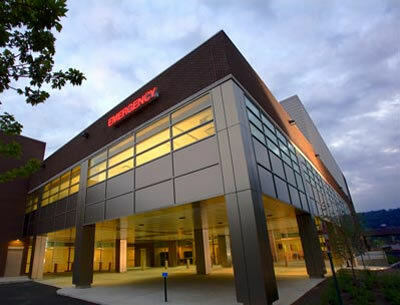 The Emergency Services Department of Southern Ohio Medical Center includes a 24-hour Emergency Department at the Main Campus. Physician/Provider care is provided by the Emergency Physician Medical Group. Nursing administration is headed by the Director of Nursing for Emergency Pediatrics & Outpatient Services. The clinical management of the department is coordinated by a Nurse Manager & Assistant Nurse Managers. The Charge Nurse functions in the absence of the Assistant Nurse Manager. The Main Campus Emergency Department offers emergency care 24 hours a day, with at least one physician experienced in emergency care on duty in the emergency area and a specialty consultation available within 30 minutes by a member of the hospital medical staff. The hospital’s scope of services includes in-house capabilities for managing physical and related emotional problems, with provisions for transfer to another facility when indicated. The emergency department physician and staff respond to all announced in-hospital codes and other emergencies. This facility is used for the care of the true emergent patient and treats chest pains, major trauma, severe respiratory problems and most ambulance patients. Triage is the process by which our emergency department personnel determine the overall condition of the patients entering the Emergency Department. Following this initial evaluation, as a patient, you will then receive the proper care, always as rapidly as possible. While we strive to keep waiting time to a minimum for all emergency department patients, the most critical patients must be seen first. Triage is why some patients see a physician more quickly. During your visit, you may be contacted by patient representatives. They will be happy to answer any questions you may have whether you are a patient or a visitor. Please let them assist you. The patient representatives currently work 12 to 24 hours per day on the Main Campus. If you are a patient waiting to be examined by a physician please do not eat or drink anything. This may interfere with your exam. If you are a visitor, we also ask you not to eat at the bedside of a patient. If you are placed in the waiting room, we apologize for this inconvenience, but please be assured you will receive the same medical attention as the patients currently being treated. Our provider on duty will attend to your needs as soon as possible. If you are in our waiting room waiting to be brought back into the treatment room areas, and you feel that you must leave before the doctor can see you, please see the nursing staff at the triage desk and tell her your concern. For the patients who are deaf or hearing impaired, we will provide an interpreter at no charge during this visit. Please inform us so that we may help you. The Emergency Department allows 1-2 visitor per patient at a time. All others are asked to wait in the waiting room. They will be updated by the patient representative on the progress of the patient they accompany. When we feel it is medically necessary, exceptions can be made on our visitor policy; that is, having no visitors or having more than one. We appreciate your cooperation. The main hospital’s visiting hours are 24 hours per day. Please check with Security for a pass after 10pm nightly..
Children under the age of 12 are not permitted to visit in the main hospital. Children are not allowed to visit patients in the Emergency Department either. Under special circumstances, permission may be granted; this is done at the nurse’s discretion. When you are dismissed from the Emergency Department, you will receive a copy of your discharge instructions on how to take care of your illness/injury at home. Please review them and ask questions if needed. You should follow up your care with a visit to your family doctor or at a clinic. If you get worse before you can visit your family doctor or clinic, please return to the Emergency Department for reevaluation. If your physician orders an outpatient test, please bring a copy of your discharge instructions with you. While in the Emergency Department, you may be seen by a Nurse Practitioner or Physician Assistant. These advance practice providers have a Master’s degree and have been specially trained to see, diagnose and treat particular health care problems. He or she works with the physician to provide you with the most efficient and appropriate care that we can provide. The physicians who see patients in the Emergency Department are not employees of the hospital. They are independent practitioners and will bill you or your insurance company for the services provided.